The Fairwinds Relief 300 series starts with organic cold pressed avocado oil, one of the healthiest oils available. Avocado has received prescription drug status in France and is marketed in Denmark as a food supplement for its anti-inflammatory effects. Non-psychoactive CBD & THCA along with all-so crucial micro-dose of THC is perfectly synergized with full plant extract, select terpene profile, essential oils and powerful safe & proven herbal extracts to provide maximum support while remaining clear minded for the highest daily functionality. Avocado Oil, cannabis concentrate, herbal extracts (Boswellia, Ginger, Turmeric), Indica cannabis terpenes, natural flavors, monk fruit, polysorbate. 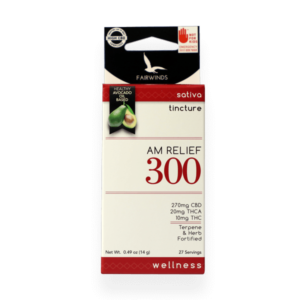 The Relief 300 formula starts with an organic cold pressed avocado oil, one of the healthiest oils available due to its natural content of Omega fatty-acids and a type of lipid called unsaponifiables. Furthermore, studies show that avocado oil assists with absorption, making it one of the most effective mediums to use in a liquid cannabis edible. With a soft, smooth & non-oily feeling, avocado oil provides a clean, natural & rich experience.